If you are missing one or more teeth, dental implants are a wonderful option to permanently replace your missing teeth. Dental implants are one of the most effective, modern tooth replacement options available. A dental implant, which is made of titanium, is surgically placed in the jawbone to replace the root of the tooth and provide a secure foundation for the dental restoration. Call to find out more about your tooth replacement options or to schedule your dental implant consultation today. Since dental implants are meant to replace the root of the tooth, not just the crown, you can expect many restorative benefits. Not only do implants help you regain your fullest biting force possible, but they also help you maintain your youthful appearance. A restored root makes it easy for blood to flow to your face, helping you prevent premature sagging and a hollowing out of the cheeks. A stronger biting force simply means that you’ll be able to eat all the tough foods you may have struggled with in the past. Furthermore, dental implants are meant to last for decades without worry of failure. In fact, their success rates reach as high as 98 percent after a 10-year period. This proves them to be a tooth replacement option that you can rely on! Dental implant tooth replacement is completed in two phases. The first phase of treatment is the surgical implantation of the dental implant below the gum line. The procedure itself varies in length and extent of impact based on the number and location of missing teeth. However, the surgical procedure itself is relatively unchanged. We start by using local anesthesia and dental sedation to ensure complete comfort. Then, we place a small incision in the gum line. Next, a dental implant is positioned, and a protective cap is attached to the implant post. This cap maintains the proper shape of the gums, so we can attach an abutment and the tooth replacement prosthetic once the implant has fused with the jaw bone. Over the course of three to six months, the gums and supportive alveolar bone tissue attach to the dental implant mimicking the natural structures of tooth roots. Once this process is completed, you’ll return to our office for the restoration phase of treatment. Dental implant tooth replacement is completed in two phases. The first phase of treatment is the surgical implantation of the dental implant below the gum line. The procedure itself varies in length and extent of impact based on the number and location of missing teeth. However, the surgical procedure itself is relatively unchanged. We start by using local anesthesia and dental sedation to ensure complete comfort. Then, we place a small incision in the gum line. Next, a dental implant is positioned, and a protective cap is attached to the implant post. This cap maintains the proper shape of the gums, so we can attach an abutment and the tooth replacement prosthetic once the implant has fused with the jaw bone. Over the course of three to six months, the gums and supportive alveolar bone tissue attach to the dental implant mimicking the natural structures of tooth roots. Once this process is completed, you’ll return to our office for the restoration phase of treatment. Dental crown – we’ll place a single dental implant and attach a dental crown shaded to match your natural dental structure to replace one tooth. In most cases, we can fuse two dental crowns together and attach them to a single implant post. Fixed bridge – like traditional fixed bridges, the implant supported variety included two dental crowns that support one or more replacement teeth known as pontics. However, rather than attaching to surrounding teeth for support, these implant supported fixed bridges are affixed to dental implant posts for a more natural tooth replacement solution. 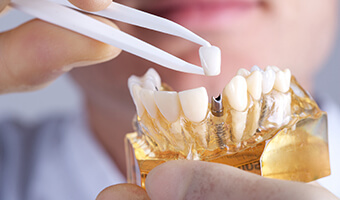 Partial and full dentures – like removable partial and full dentures, dental implant supported prosthetics are used to replace a number of consecutive or nonconsecutive teeth or a full arch of teeth. These extensive tooth replacement solutions pair a gum colored base with tooth-colored replacement teeth in order to create one tooth replacement prosthetic that restores numerous lost teeth. Rather than relying on surrounding teeth or gum tissue for support, partial and full dentures are supported with four to six dental implant posts. All-on-4 – this unique dental implant supported tooth replacement solution allows our team to attach a full arch of replacement teeth to four to six implant posts. 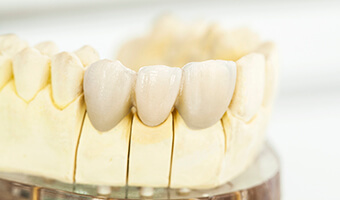 Unlike traditional implant supported dentures, the All-on-4 treatment technique allows us to utilize the naturally denser portions of the jawbone. Instead of positioning implants vertically across the jaw, the All-on-4 procedure places two vertical implant posts at the front of the jaw bone, and two diagonally positioned implants that run from the back of the mouth into the front portion of the jawbone providing support for the entire denture without the need for advanced bone grafting or other invasive procedures. Our experienced dentists at Chambers Family Dentistry will help you determine which type of dental implant restoration will best fit your needs. Consider your options below! We’ll place a single dental implant and attach a dental crown shaded to match your natural dental structure to replace one tooth. In most cases, we can fuse two dental crowns together and attach them to a single implant post. Like traditional fixed bridges, the implant supported variety includes two dental crowns that support one or more replacement teeth known as pontics. However, rather than attaching to surrounding teeth for support, these implant supported fixed bridges are affixed to dental implant posts for a more natural tooth replacement solution. Like removable partial and full dentures, dental implant supported prosthetics are used to replace a number of consecutive or nonconsecutive teeth or a full arch of teeth. These extensive tooth replacement solutions pair a gum colored base with tooth-colored replacement teeth in order to create one tooth replacement prosthetic that restores numerous lost teeth. Rather than relying on surrounding teeth or gum tissue for support, partial and full dentures are supported with four to six dental implant posts. Furthermore, All-on-4 implant restorations allow our team to attach a full arch of replacement teeth to four to six implant posts. Unlike traditional implant supported dentures, the All-on-4 treatment technique allows us to utilize the naturally denser portions of the jawbone. Instead of positioning implants vertically across the jaw, the All-on-4 procedure places two vertical implant posts at the front of the jaw bone, and two diagonally positioned implants that run from the back of the mouth into the front portion of the jawbone providing support for the entire denture without the need for advanced bone grafting or other invasive procedures. Dental implants are incredibly versatile, which is why providing a cost upfront is not possible until you’ve had a thorough implant consultation with an Annapolis dentist. During that meeting, you’ll be able to discuss crucial details of your procedure. This includes the number of teeth you plan on replacing, the number of implants needed to restore teeth, and the cost of creating and placing your restoration. In some cases, you may require preparatory treatments (i.e. bone grafts), which can increase total cost as well. Regardless of the implant you choose, it’s important to note that dental implants are widely considered to be a long-term investment. They should last for multiple decades without issue, which is rarely said about traditional bridges and dentures. Dr. Chambers, Dr. Raimondo, and Dr. Jiminez will ensure that your dental implant fits your mouth comfortably and aesthetically. With proper care, your dental implant can last a lifetime! To learn more about the advantages of implant dentistry, we invite you to contact our Annapolis, Maryland dental office today.